Australia is a beautiful and relatively safe country to visit. However, it also has one of the highest levels of UV radiation in the world. So when packing your beach bag it’s important to include full sun protection (not just sunscreen). We also have some sea creatures that can deliver quite a painful sting, so be prepared and you’ll be able to enjoy our beautiful beaches. It’s going to be another scorching summer down under but before you hit one of Australia’s famous beaches, check that your beach bag has all of these essentials. Australia has some of the highest rates of skin cancer in the world, so it’s very important that you remember to protect your skin from UV damage whenever you’re out in the sun. To help prevent skin cancer, the Cancer Council came up with the Slip! Slop! Slap! campaign. Slop on some broad-spectrum, water-resistant, SPF30+ (or higher) sunscreen. Slap on a broad brim or legionnaire style hat to protect your face and neck. It’s important to note that not all clothing will protect your skin from sun damage. So while that kaftan you bought last week may be cute, if it isn’t made from a tightly woven, lightweight natural fabric, it won’t protect you from the harsh Australian sun. Layering isn’t just a fashion trend, it also protects you from the sun and remember, darker colours provide more protection than white or pastels. 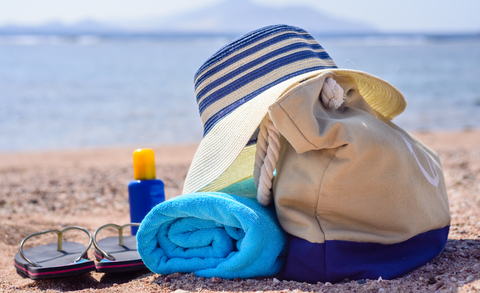 No matter what you choose to wear to the beach, you’ll need to keep a change of dry clothes in your beach bag because wet clothing provides less protection from the sun’s harmful UV rays. Not just any old towel will do at the beach. Sand free beach towels allow sand to easily slip off and they absorb up to a litre of water. A sand free beach towel will dry quickly and is light weight and compact enough to carry in your beach bag without weighing you down. These full-sized beach towels are durable, have a handy hook, and are also suitable for the pool, yoga and travel. Just like your old beach towel, your old sunglasses aren’t good enough when you’re under the Australian sun. Choose a pair of close-fitting, wrap-around style sunglasses to protect your eyes from UV damage. Your sunglasses will also need to be polarised to reduce glare, making it easier to see on a sunny day. Jelly fish, bluebottles, submerged objects in the water and in the sand – Australian beaches can be hazardous, so when packing your beach bag, don’t forget to include a travel-size first aid kit which includes band aids (plasters), antiseptic. disposable sterile gloves, bandages, insect bite cream or spray, and a thermos of hot water to treat sea creature stings. If the person stung is in distress or is having trouble breathing, call 000 for an ambulance.